I've never seen an episode of Reading Rainbow. I know! It was on from 1983-2006! How could I have missed 155 episodes of the show! So when STW BIL sent me his guest blogger post below, and said it was written a la Reading Rainbow, the reference totally went over my head. Sure, I've seen bits and pieces of it over the years, and heard my sisters rave about Levar Burton, but I've never sat down for a full-blown episode. Of course, I had to go look up the wiki. Still, the below's written in voice so well, that it's not hard to imagine hearing Levar in your head, reading the below magnetpost aloud to you. Hi, I’m a guest blogger. Do you enjoy stories of giants, epic battles, and wild exotic lands? Well, then this magnet is for you. 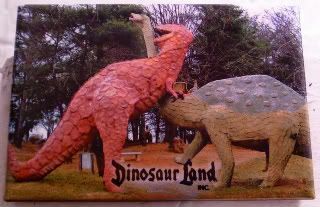 Dinosaurs may have lived millions of years ago, but there’s one place in Virginia where you can relive their glory days. What would you call this intriguing land of dinosaurs? Dinosaur Land takes us back to a simpler pre-Spielbergian time when plastic replicas represented these giants and roadside attractions brought people from miles around on the weekends. You can see the dinosaur battle reenacted by the titans on the magnet, and if you squint hard enough you’ll swear that they really moved. They have all the dinosaurs you’ve come to love and know like stegosaurus, triceratops, and brontosaurus; and a few you may not really know such as the oviraptor and iguanadon. Each one has a written description of where it lived and what it ate. If you find yourself near Winchester, VA, Dinosaur Land makes for a fun afternoon. But don’t take my word for it…..find out for yourself! It *does* read like Reading Rainbow. How have you NOT seen the show, Joy? I think you have and you have a false memory. Yep, STWBIL did a great job. Thanks for guesting! And, nope, I promise you, I've seen a million segments, but never one whole episode. I mourn for my childhood, too. the king kong definitely throws you off when you see it, but i liked the smilodon. Hahah, I kinda thought he was joking about the thing called Smilodon.